Cafe Crema is a new addition to the coffee scene in the West of Singapore, which until recently was lacking quality coffee (with Jimmy Monkey being a notable exception). 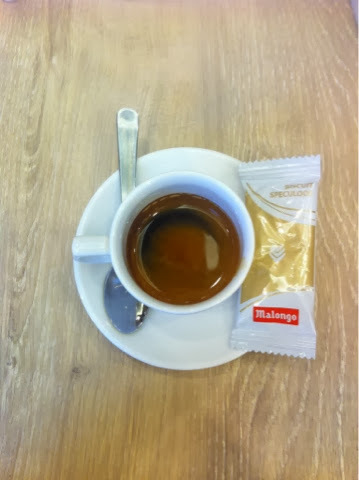 Espresso - dark brown crema topped a potent and rich, syrupy shot. There was some acidity, but it was not overwhelming or astringent - this was a nicely balanced shot. The volume was just right, not over or under extracted, so that the intensity of the shot was not lost. In a nutshell, the baristas know what they're doing. They know the difference between a single and a double shot, with the barista correctly pointing out which was which when they were delivered. Piccolo latte - this is advertised as a speciality of the cafe, with a prominent sign over the counter explaining what it is - even now, with an abundance of cafe's, they are not that common. Fortunately, the expectation lived up to the reality. The things that make up a good piccolo ate here - the correct size and layer of foam, smooth microfoam with competent latte art, with the foam imparting the correct mouthfeel and smoothness. Coffee taste is still there, as it should be in a Piccollo. One thing that I noticed - there are ristretto shots on the menu, which is something that is even less common than a piccolo. This tells me that there is a fundamental product knowledge amongst the staff - they know the difference between an espresso and ristretto - the basic building blocks of any coffee - it's harder to get a bad coffee when the fundamentals are correct. I noticed two potential improvements though - there does not seem to be any drip / filter coffees on the menu. It would be good to have an option for V60 pourovers, Aeropress or Chemex coffees too - they don't take up a lot of space, and this will allow Cafe Crema to cater to a wider variety of tastes. Also, some of the serving sizes seen quite large - roughly around 7oz - so the coffee flavour may be lost. However, I have not tried those drinks, so I can't confirm that until I do. This is definitely somewhere I'd come back to, and it's a pleasant surprise to find it amongst the usual selection of lookalike franchises. Simple, well crafted shots are all that I need.